The kids asked if I would by them some apple cider. Roaming around at the ward Halloween Party (he didn't like wearing the lion head). We have a plenty of dress up costumes at home so I told the kids they had to pick their costumes out of there. Maybe next year we will buy new Halloween costumes. Got James to wear his lion head for a few laps around the gym. All three kids have had a turn being a lion. 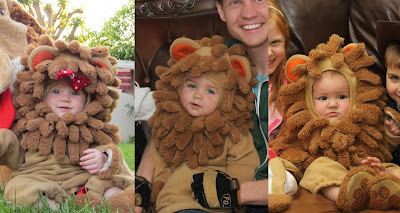 James (on the right) was the lion 2 years in a row.